Hello gardeners! Grab your cup of coffee or tea or maybe just a small glass of wine as we take a brief stroll down the garden path to learn about our easy-going, easy-growing friend—the daylily. These perennials are a grower’s favorite because of their undemanding nature and their habit of producing bright colorful blooms throughout most of the summer. And, when the blooms do finally stop with the approach of cooler weather, the roots are winter hardy for the most part and will survive through all but the harshest of cold weather conditions. The daylily is so named because each bloom generally lasts only one day, opening with the rising sun and fading with the setting sun—although some do last beyond this. This distinctive and unusual flowering habit could cause a “don’t blink or you’ll miss it” gardening crisis if not for the fact that each daylily clump produces many flowers, with new blooms replacing the fading ones over the length of the summer. Also, daylilies are usually planted in masses—thus producing even more continuous blooms throughout the flowering season. 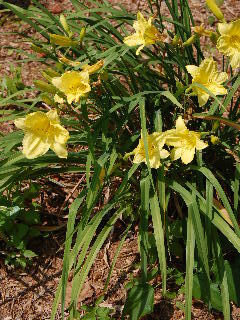 Through the years, the daylily clumps will spread and thicken to the point where the clumps can be lifted and separated. This should be done after the summer flowering has finished. Lift the clumps with a shovel, being careful to dig deeply enough to get a mass of roots. Divide the clumps such that there is plenty of root and top growth with each section. Reset each section so that the crown is about an inch below the soil surface. Cut the remaining tops down to about 6 or 8 inches of height. Then clean up and mulch lightly around the newly set plants. Daylilies are available in a wide assortment of colorful blooms—orange, red, purple, gold, yellow, and several varied shadings in between. I still prefer the humble and simple beauty of the yellow ones—they somehow reflect the faithful and enduring constancy of the life-giving summer sun. Site location is important when adding daylilies to your garden—be sure they will get a good dose of that friendly old sunshine, a minimum of 6 hours daily to keep those beautiful blooms coming. Loose organic soil and adequate moisture are about the only other requirements needed to keep your daylilies happy. An inch or two of mulch around the plants helps keep weeds and competing vegetation at bay. 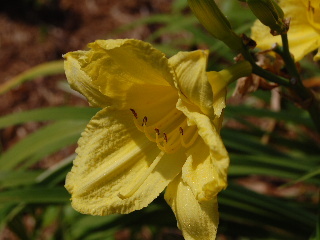 Daylilies are little affected by insect pests or disease. Cut off the seedpods after blooming is finished and generally keep the area tidy to present a neater looking garden. In the early spring, remove any remaining withered brown tops from the plants (some daylilies are evergreen in nature, with the foliage maintaining its color throughout the winter). Clean up the bed, add a bit of compost, mulch lightly, and get ready for another summer of ongoing blooms.